DANTE N. BIELLO was the beloved husband of Jeanne (nee Scott) of Chagrin Falls, Ohio. Dante was a long time resident of Shaker Heights, Ohio. 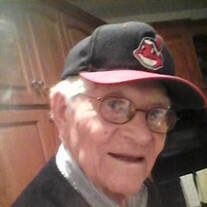 Born in Cleveland's "Little Italy", Dante attended Shaw High, class of 1939. He graduated from Western Reserve University and had an MBA from Harvard University. Before those degrees, he served during World War II with the United States Navy. Dante held several business management positions over the years and retired as the Vice President of Finance for Cuyahoga Community College. Dante wa one of the co-founders of the Shaker Youth Baseball League and as a member of the Orange Kiwanis Club, was instrumental in establishing the annual Kiwanis Teachers Awards for the Orange teachers. Dante was also a member of the Sigma Chi fraternity. Dante was the dear father of Nancy J. Wolfinger of Chagrin Falls, OH and the late Daniel R. Biello, the dear grandfather of David S. Biello (ShiiAnn), Timothy R. Biello (Jaime) and Eric L. Wolfinger and the dear great grandfather of Beatrice, Desmond and Finnegan Biello. Dante was also the dear brother of the late Marie Buell and Alger Biello. The family prefers that those who wish may make contributions in his name to The Daniel R. Biello Memorial Fund of The Shaker Schools Foundation, 15600 Parkland Dr., Shaker Hts., OH 44120. Funeral Services will be held Saturday, October 7th at 1 PM in Garfield Memorial United Methodist Church, 3650 Lander Rd., Pepper Pike, OH. Interment Lake View Cemetery. FRIENDS MAY CALL AT BROWN-FORWARD, 17022 CHAGRIN BLVD., SHAKER HTS., OH, FRIDAY, OCTOBER 6TH FROM 4 TO 6 PM.